HORZE - Easy Stud Set. RRP: 44,95 € tax incl. 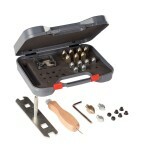 Includes : grass, ice, blind studs, Cleaner, Allen key, stud key and screw thread tool.